Must modify stock exhaust to retain catalytic converter(s). Will not fit with A.I.R. pump. Installation on vehicles 78 and earlier with air conditioning will require purchase of 555-30782 bracket. 79 and later vehicles equipped with short compressor will re-use the original bracket. Must modify lower A-Arm support bracket on 79-81 models.Will not fit angle plug heads. Pre-70 vehicles with exhaust mounted alternator/generator will require purchase of 555-30780 bracket. Will not fit 67-69 Camaro with A/C. The #1 tube (front drivers) has a small dent for spark plug and spark plug wire clearance. JEGS Tubular Headers offer an immediate increase in performance by eliminating back pressure, improving exhaust flow, and building more horsepower. Constructed from cold-rolled, flash-controlled 16-gauge steel tubing and finished with a black satin paint or silver ceramic heat-resistant outer coating for ultimate resistance to rust & corrosion. These headers are equipped with an O-ring port seal and 5/16 in. thick flanges that are heavy enough to maintain complete integrity, yet pliable enough to create a leak free seal. The consistent tubing diameter contributes to the smooth air flow and greater exhaust velocity of these carefully engineered headers while the precision-welded collectors give you a perfect fit. Does JEGS 30050 fit your vehicle? 30050 is rated 4.4 out of 5 by 21. Rated 5 out of 5 by cjkel982 from Fit like a glove, great construction and sound! I am working on an '81 Camaro, having replaced the original 4.4L (yup) with a modified 350 w/vortec heads. I was hesitant about these, but I am broke. These headers fit perfectly-no grinding, hammering. bolted easy and sound great! Solid construction. A great value ! Rated 5 out of 5 by ChiChevelle from You need to know Great quality but I paired these with a set of Dart angle plug heads on a SBC. High quality tubing and great flange thickness as well. Had to heat and ding #1 really deep and #2. Would only require a small design change. The the finish goes with the economical price. Rated 5 out of 5 by scottid3d from GREAT FIT Bought these recently. Had to put a small dimple in the rear tube on the passenger side for better clearance to the header bolt. Installed them myself with some cheap jack stands. Easy job. Header flanges are very thick! My 68 Firebird with a SBC never sounded better. No, this will not fit your GMC Yukon. Are these headers for a 86 c10 305? Will these headers for on my 1975 Monte Carlo? Will these fit a 1984 El Camino, no A/C, stock Goodwrench 350, with a three speed auto on the column? Yes, this will fit your Chevy El Camino. 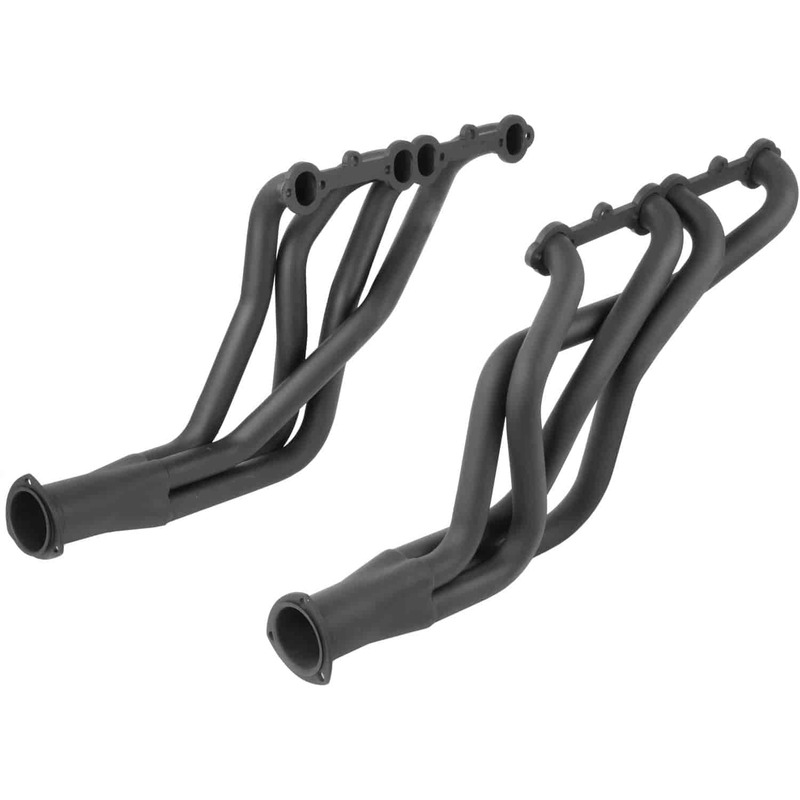 Will these Full Length Headers fit my 91 Chevy Silverado, with 350 cu. In. Engine , it's 4-Wheel drive- K-1500. Looking to buy this motor, 138-BP3501CTC1K, to install into my 64 Catalina. Will these fit both applications? Has the original 389 currently. Any other items I may need? Thanks in advance. You will want to check your engine mounts to make sure they will accommodate the Chevy engine, You will also need a transmission adapter to connect the Pontiac transmission.